"What a win-win this is for our community to keep a wonderful corporation like Incyte here that could have easily gone anywhere," said Councilman Bob Weiner. New Castle County has given Incyte Corp. approval to build office space for another 450 employees adjacent to the old Wanamaker building the pharmaceutical company bought in 2014. The County Council on Tuesday unanimously authorized the 154,000-square-foot, four-story office building and 473-vehicle garage behind the existing 180,000 square-foot headquarters at 1801 Augustine Road, near Augustine Cut-Off. 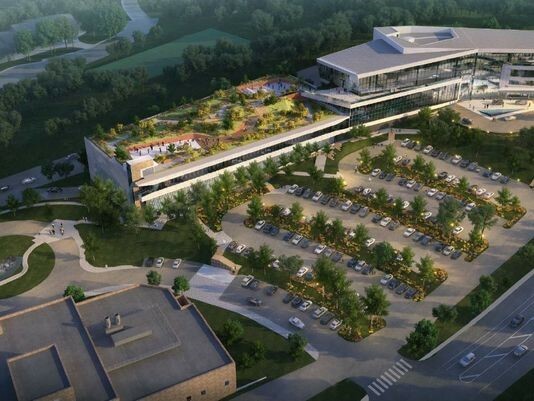 The new office building will be connected by a covered walkway to the parking garage that will feature a green area on the roof. The new building will accommodate about 450 employees, including existing workers and new hires. Construction is expected to take about 18 months. The company already employs about 450 in New Castle County, with annual salaries averaging about $125,000. The company is purchasing the 16.7-acre parcel from developer Louis J. Capano, Jr., who acquired it in 1989. The deal is valued at $80 million. Capano in 2014 completed a $35 million renovation of the building, which had been a Wanamaker's department store. Incyte leased space at DuPont Co.’s Experimental Station near Alapocas since 2003. The company was founded in Palo Alto, California, in 1991, focusing on genomics and went public in 1993. Today, the company’s focus is developing new cancer treatments. The company has one Food and Drug Administration approved product for treating rare blood cancers, Jakafi. The company has added about 200 jobs in recent years and in April announced plans for a new European headquarters in Geneva, Switzerland. The state has aided its growth with an $11 million package of economic development grants. Incyte turned a larger profit than expected in 2015, based on strong U.S. sales of its anti-cancer drug, Jakafi. The company in February reported an annual net income of $7 million, or 3 cents per diluted share. That's up from the $48 million net loss, or 29 cent-per-share loss, that the company recorded in 2014.